ADAM sets new milestone in medical technology by launching the 3D bioprinting of organic bone structures. ADAM has started passing the regulatory requirements to begin preclinical trials this month. ADAM is a biotechnical initiative, cofounded by Kwambio (the 3D printing experts) and WeFund Ventures (an early stage venture fund). 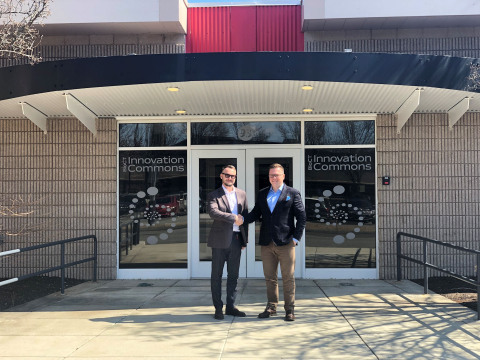 It is based in BioCT Innovation Commons (Groton, CT), and has already gained support from Applied Medical and Techstars. The core of ADAM’s innovative approach is the combination of new materials for 3D printing. One is a modified biopolymer based on polycaprolactone with the addition of hydroxyapatite, which has high strength and good bioresorbability. Another is a ceramic bioglass based on hydroxyapatite and borosilicate glass, which is able to react with bone tissue to effectively connect with the implant and stimulate osteogenesis. Defects in bones that do not bear direct physical exertion and perform only protective and skeletal functions (bones of the skull, upper and lower jaws), could be treated with ceramic bioglass implants, while modified biopolymer would be used for defects in tubular bones. Materials have been successfully tested at Lund University (Sweden). “120,000 people are in the waiting list for organ transplants in the USA. Over 1 million people have the same needs all over the world. New technologies aim to solve this problem, and ADAM is the first ever opportunity to print organic bones. The key reason for us to launch this project is to help people save their lives,” says Volodymyr Usov, CEO at ADAM. “Global 3D Bioprinting Market is rapidly growing. According to researches, it is going to develop very intensively up to 2024, achieving more than USD2.5 billion. We do believe in the potential of the team, which previously has launched successful 3D printing projects that already gained a lot of attention. And we hope that ADAM will bring this endeavor for innovations to the next level,” comments Denys Gurak, partner at WeFund Ventures and Chairman of the Board at ADAM. One of the planned next steps of the project is to develop a cloud-based digital platform, for creating a 3D model of a body using computer tomography files.